As we start off a new year, it's worth a moment to look back at what an amazing year we had in 2018. The following is a summary of the many accomplishments of our clinical faculty, research staff, and residents over the past year. Babacar Cisse, MD, PhD, Leon Levy Research Fellow at the Feil Family Brain and Mind Research Institute, was named Leonard and Fleur Harlan Clinical Scholar. The award will allow Dr. Cisse to develop his brain tumor research laboratory, which focuses on the development and progression of gliomas. Dr. Michael Kaplitt was awarded a $750,000 grant from the JPB Foundation to investigate gene therapy for Parkinson’s disease. The grant supports studies examining mechanisms of vocalization dysfunction in animal models and possible ways to use gene therapy to reverse it, as well as studies examining potential pathways for spreading pathology from the gut to the brain and gene therapy approaches to prevent it. Dr. Michael Kaplitt was awarded a $100,000 grant from the Michael J. Fox Foundation for “Magnetic Resonance-Guided Focused Ultrasound Gene Delivery for Neuroprotection in Parkinson’s Disease.” This grant supports an animal study testing the use of focused ultrasound to disrupt the blood-brain barrier to deliver new strains of gene therapy agents through simple IV injection. Dr. Roberta Marongiu was awarded a research grant by the American Parkinson’s Disease Association to investigate the role of menopause in the risk of developing the movement disorder. Dr. Marongiu’s research will focus on menopause as a transition state in susceptibility to Parkinson’s disease. 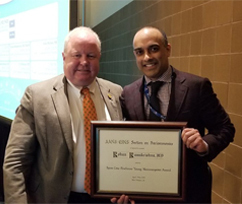 Dr. Rohan Ramakrishna was selected for the Leadership Education and Development (LEAD) program at NewYork-Presbyterian Hospital. 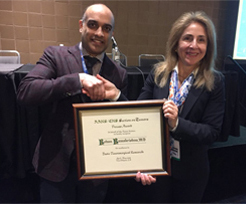 Dr. Jared Knopman delivered the invited “Hero of Neurosurgery” Plenary talk at the Congress of Neurosurgeons in Houston, Texas, for his work with MMA embolization for subdural hematomas. Dr. Mark Souweidane was selected by the NCI to serve as Neurological Surgery Special Expert on its Brain Malignancies Steering Committee (BMSC). Dr. Theodore Schwartz delivered the Robert M. Ellsworth Lecture in Ophthalmology, which honors the memory of this important figure in the development of treatments for retinoblastoma. Dr. Susan Pannullo was honored at the 2018 annual meeting of the American Association of Neurological Surgeons for service on its Board of Directors as one of the few women in neurosurgical history to serve in this capacity. 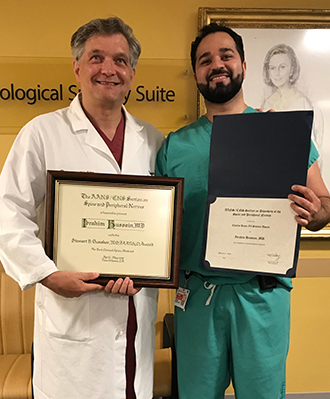 Dr. Ali Baaj was selected to the Value and Safety Committee of the prestigious Scoliosis Research Society for the 2018-2019 term. Dr. Susan Pannullo was awarded an NREF grant as faculty advisor to the WCM AANS Medical Student Chapter Neurosurgery Medical Student Training Camp. Making the List: 2018's "Best Doctors in New York"